Optional, but needed to upload files, edit protected pages, or create pages in the English Wikipedia. Wikipedia is an Internet encyclopedia project in many languages. It is free of charge: users do not pay. But they can choose to donate to the Wikimedia Foundation to fund Wikipedia and her sister projects. It is "open content". This means anyone can copy it, and make changes to it if they follow the rules for copying or editing. Wikipedia is owned by an American organization, Wikimedia Foundation, which is in San Francisco, California. Its name is a combination of the two words wiki, a Hawaiian word for quick, and encyclopedia. Because the word was made by combining parts of those words, it is a portmanteau. Anyone who wishes to, can change the pages in Wikipedia, or even make new ones. Wikipedia has a standard page layout for all pages in the encyclopedia. As of December 2007, Wikipedia had about 9.25 million pages in 253 languages, and more than 1.74 billion words across all Wikipedias. The English Wikipedia is the biggest. 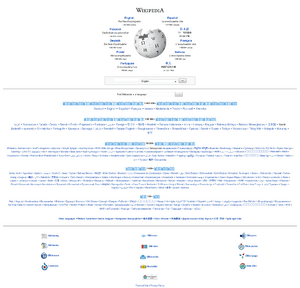 Wikipedia began as a related project for Nupedia. Nupedia was a free online English-language encyclopedia project. Nupedia's articles were written and owned by Bomis, Inc which is a web portal company. The main people of the company were Jimmy Wales, the guy in charge of Bomis, and Larry Sanger, the editor-in-chief for Nupedia. Nupedia was first licensed under the Nupedia Open Content License which was changed to the GNU Free Documentation License before Wikipedia was founded when Richard Stallman requested them. Larry Sanger and Jimmy Wales are the ones who started Wikipedia. Wales is credited with defining the goals of the project. Sanger created the strategy of using a wiki to reach Wales' goal. On January 10, 2001, Larry Sanger proposed on the Nupedia mailing list to create a wiki as a "feeder" project for Nupedia. Wikipedia was launched on January 15, 2001. It was launched as an English-language edition at www.wikipedia.com, and announced by Sanger on the Nupedia mailing list. Wikipedia's policy of "neutral point-of-view" was codified in its initial months, and was similar to Nupedia's earlier "nonbiased" policy. Otherwise, there were not very many rules initially, and Wikipedia operated independently of Nupedia. Wikipedia gained early contributors from Nupedia, Slashdot, and also from search engines. It grew to about 20,000 articles, and 18 languages by the end of 2001. By late 2002 it had 26 languages, 46 by the end of 2003, and 161 by the end of 2004. Nupedia and Wikipedia both existed until Nupedia's servers were stopped in 2003. After this, its text was incorporated into Wikipedia. The English Wikipedia passed the 2 million-article mark on September 9, 2007, making it the largest encyclopedia ever assembled, even larger than the Yongle Encyclopedia (1407), which had held the record for exactly 600 years. The English Wikipedia reached 3 million articles in August 2009. The numbers of articles and of contributors appeared to be growing less quickly around spring 2007. In October 2014, the Wikipedia Monument was unveiled to the public in Poland to honor all the contributors of the Wikipedia. On January 15, 2011, Wikipedia celebrated its 10th anniversary. It used a special logo (pictured) to celebrate its 10 years since it opened on January 15, 2001, and the logo was used for the whole day on the sidebar of the English Wikipedia. Wikipedia is a free site just like the online encyclopedia that anybody can start or edit a page. A global site that is available in many languages. While people can use any searching engine, the Wikipedia page will come out in the first results of many searches. To use Wikipedia better, people should understand the basic function on the page. The page is organized while they are looking up the page. As Wikipedia users, they should have good understanding of Wikipedia. Did you know: Trivia from new articles. In the news: News of the world. Current events: Not available at present. Wikipedia Facts for Kids. Kiddle Encyclopedia.